Crazy, crazy week, but I went for it and decided to wear a wilder color at work to test the waters. Nobody batted an eye! Hello Fowl Play! 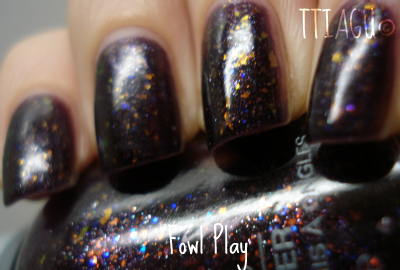 Yes, Fowl Play has been a really big deal this fall and really hard to find for the past few months because of it. I am happy to report it’s out and about and I finally scored one! But did it live up to the hype? The Application: Fowl Play was a little thicker than expected. Maybe it’s the glitter, maybe it’s the formula, maybe it’s the bottle I picked up. Still, it was a little gloopy and took a lot of concentration to get it on the nails. 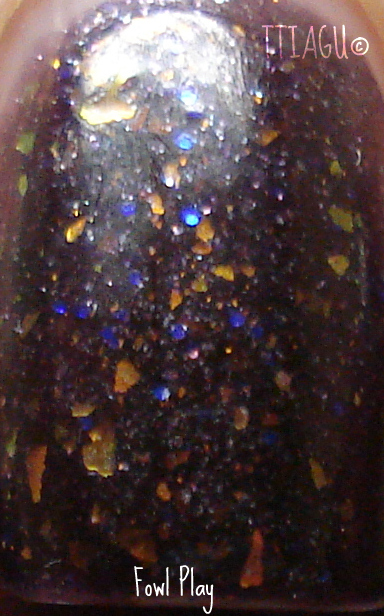 It took three coats to become opaque. The Verdict: You know, I wanted to hate Fowl Play, but I couldn’t do it. I love how it looks on my nails and I love that it makes me think of turkeys. Yes, it makes me strange, but there it is! There really isn’t a lot of colors like this and though the application wasn’t the best, the wear was excellent and the bottle size is awesome. Yep, Orly’s makes their polishes .6 Oz. Take that other companies that charge a lot more for less! 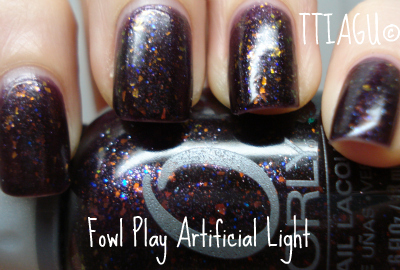 I have to give Orly and Fowl Play the thumbs up!